With the multiplicity of tour options, it can be hard to decide on the best way to visit the Galapagos Islands. The archipelago is vast and travelling to every single island is economically unfeasible for most; this is why choosing the tour that best suits your family’s interests is essential. Metropolitan Touring stands out among Galapagos Tour Operators in that each of its itineraries has been painstakingly crafted to ensure maximum enjoyment. However, it’s also important that you choose the right ship for your travelling needs. Our fleet is composed of three unique ships: Isabela II, Santa Cruz II, and Pinta. Although any of our ships are a perfect option for most travelers, each ship provides a unique taste and atmosphere that may prove more to your liking. In this blog, we’ll explore each of our ships in detail and help you understand what makes each vessel unique in its own way. We hope that this information will help you decide which one is most appropriate for your journey, as well as the exclusive benefits you’ll enjoy by travelling with Metropolitan Touring’s award-winning fleet. The Isabela II is one of our most popular yachts, particular among cost-conscious travelers. When it comes to bang-for-your-buck, you won’t find a better option than Isabela II. Although visiting the Galapagos isn’t cheap (mainly due to the vast expanse in which the archipelago is located and long ship-travel times from island to island), Isabela II offers an incredible journey for an unbeatable price. Experiencing the glory of the Galapagos Islands to its fullest extent requires traveling to several islands, as each is endowed with unique species and landscapes that don’t occur anywhere else. Isabela II’s itineraries cover wide expanses and have been carefully designed by experienced Galapagos Tour Guides, to ensure that you experience as many unique features of each island as possible. Isabela II attracts an adventurous crowd, whose interests are mostly focused on exploring and discovering everything the islands have on offer. Couples, university friends, and those seeking adrenaline will feel most at home during a trip on this yacht. We’ve designed the Isabela II experience to be both intimate and social; expect to make lifelong friends during your journey. So, should you choose Isabela II? If you’re a budget-conscious young adult or couple with an unquenchable thirst for exploration, Isabela II’s nautical thrills are best suited for you! Santa Cruz II is Metropolitan Touring’s flagship vessel and is ideally suited for families and tour groups. As largest ship in our fleet, Santa Cruz II was designed to contain as many independent social spaces as constraints would allow. This means that, whether you feel like spending the afternoon alone, reading on deck, playing with your kids, snoozing in the jacuzzi, or enjoying a drink at the bar, Santa Cruz II will have you covered. This 5-deck vessel offers 50 luxury-sized cabins that accommodate 90 guests. Extremely popular with families, Santa Cruz II was conceived to accommodate your every whim. In fact, Santa Cruz II offers the widest array of land & water activities out of any ship in the Galapagos Islands. This means that, day or night, rain or shine, each member of your family will have the opportunity to discover, play, and relax to their heart’s content. A trip to the Galapagos Islands should be a life-changing experience – and Santa Cruz II’s multiple amenities, exotic gastronomy, and expertly-trained crew ensure that this is always the case. Our ship’s itinerary has been carefully crafted to ensure that your family sees as many endemic animals and breathtaking landscapes as possible; there is never a dull moment aboard the Santa Cruz II. So, should you choose Santa Cruz II? If you seek a magical journey through the Enchanted Isles that will delight every single member of your family, no matter their interests, Santa Cruz II is the ship you’re looking for! La Pinta is our most exclusive vessel, designed to combine the highest level of luxury with the Galapagos’ most fascinating itineraries. When it comes to space-to-passenger ratio, La Pinta is unrivalled among ships in the archipelago, offering a relaxing 30 square meters per passenger on average. This means that you will have enough privacy and space to relax, enjoy, and discover, at your own pace. Each of La Pinta’s 24 luxury-sized cabins is endowed with panoramic, ocean-facing windows, stylish bathrooms, and exclusive amenities. Travelers will also be treated to sumptuous meals, executed to perfection by one of our world-class Chefs. Finally, to ensure for maximum comfort, La Pinta offers numerous amenities and social areas, including a sprawling observation deck, a large jacuzzi, and a petite cardio-gym. 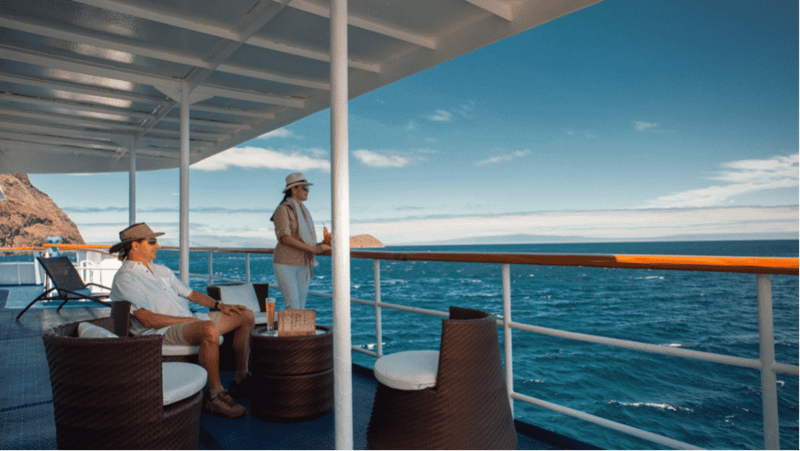 We designed La Pinta to provide passengers with an exclusive, stunning overview of the Galapagos Islands’ sights and endemic animals, as well as an unrivalled variety of land and water activities. Couples and families looking to experience the islands in their fullest glory should look no further than La Pinta. So, should you choose La Pinta? Couples looking to have complete control over their experience and enjoy the Galapagos Islands’ most luxurious vessel will find that La Pinta is ideally suited to their needs. At Metropolitan Touring, we are committed to making every trip to the Galapagos Islands a dream come true. That’s why each of our ships offers wide, open spaces, luxurious finishes, unrivalled itineraries, and an expert staff: to ensure that this trip becomes one of your most cherished memories. It’s never too late to explore the world’s wonders. Book your trip today!